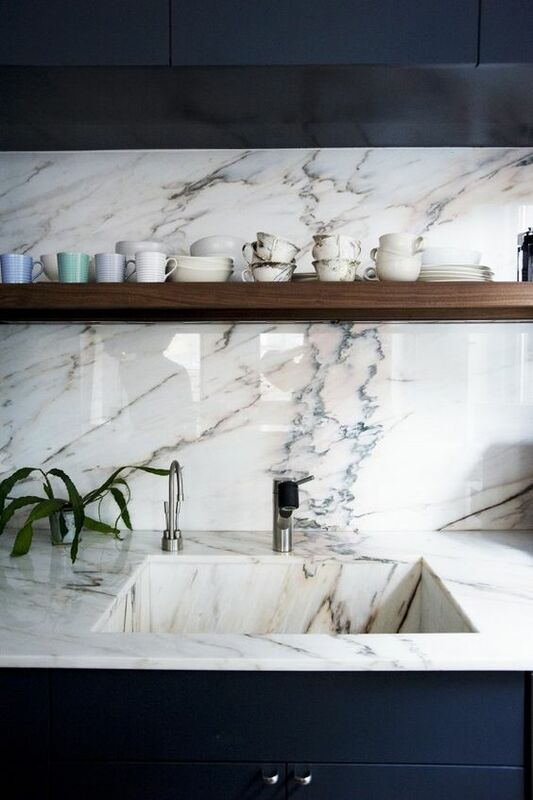 Check out quartzite countertops for a unique blend of functionality and cost effectiveness that will really make you happy for your kitchen. Are you looking for a unique countertop that will provide you with plenty of color options but a lot of durability as well? If you are then you definitely want to look at something other than laminates or standard cheap versions of countertops. What you really want to look at is quartzite countertops to get yourself a great look. of one of many white granite colors. 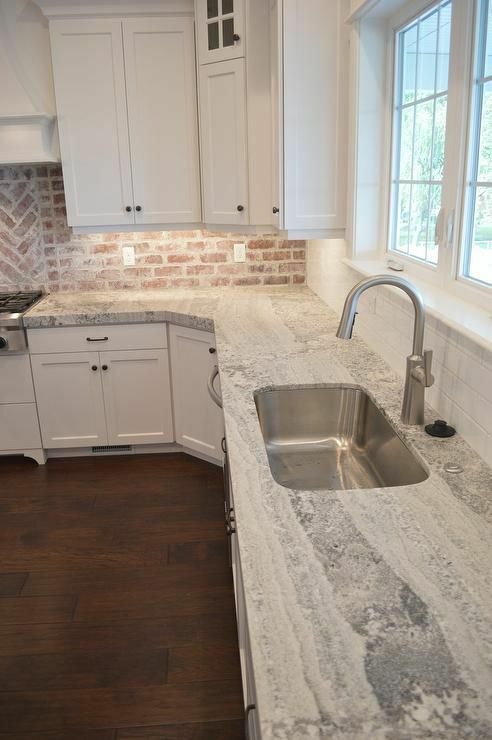 Quartzite countertops are a type of natural stone that comes in colors of white and gray. They can have different colors threaded through such as a little bit of black or brown threading. But you may even get to see other colors like pink or red or even blue, yellow and green, because different types of materials can get in and help tweak the colors. If you want something unique then this is a great choice. If you’re looking for durability they are great as well, because they have a stronger frame than other types of stone, like marble. You’ll also have a very natural look to the stone that you put in, which is going to provide a beautiful pattern and style for the kitchen or bathroom or any other room in your house. 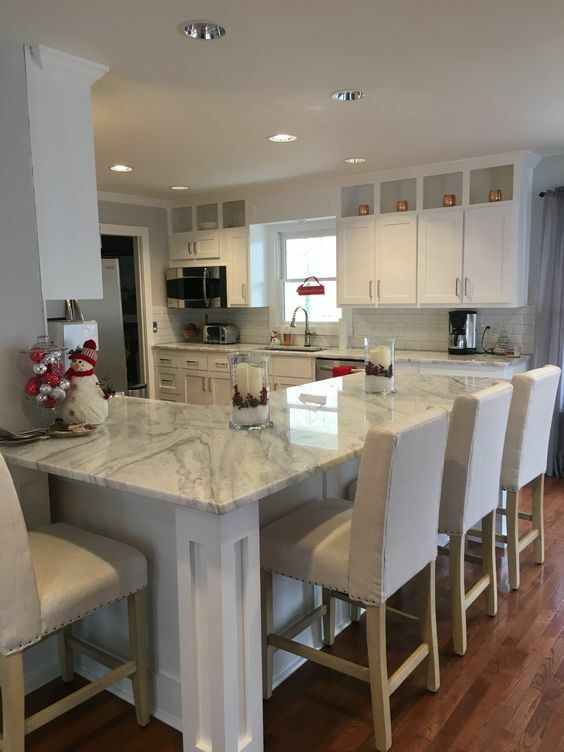 What is the Cost of Quartzite Countertops? Quartzite countertops are a little more expensive than other counter options, which makes them a questionable choice for a lot of people. You may want to consider this in your calculations because it is a very difficult piece of stone to cut and piece out into slabs. If you’re looking at having some put in for yourself, you’ll want to know more about these costs. 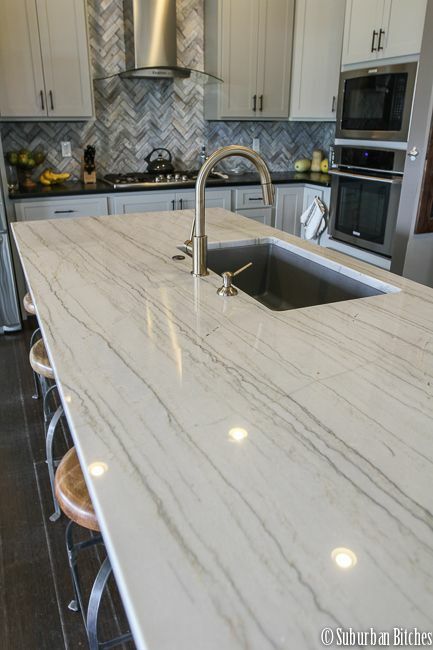 Quartzite can be as low as $60 per square foot, but you’re generally going to spend a lot more than $100 per square foot to get good quality pieces. If you’re looking for more rare pieces, such as pure colors, you’re likely going to spend even more than this, which is important to consider. Look at the quality that you really want to make sure that you are spending the right quality. If you’re looking for different types of style you’ll definitely want to look at this material because it has a variety of different options. The material can be found in several different colors and patterns. 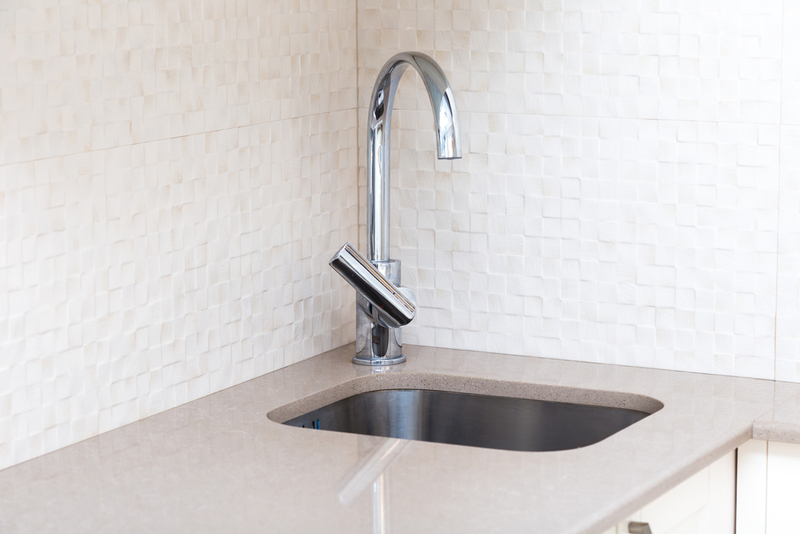 It can also be used in different ways from larger slabs of countertops to smaller pieces as backsplash or even floor tiles. The important thing is looking at the ways that you can find this material and what can be done to accent the pieces if you’re looking for lower cost. 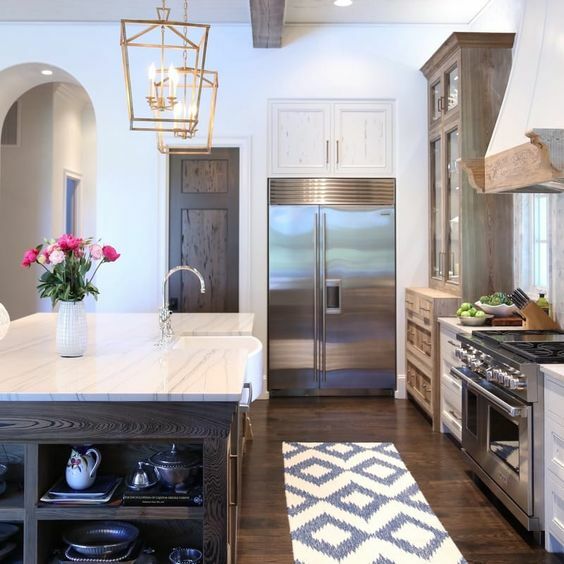 You may want to accent with other pieces of granite, marble or other types of quartzite to make sure you get a good balance. Here we have a number of additional options that you should check out. You will definitely want to look at these and find out more about which one is going to give you the best possible choices with designs. It could be something super unique and ideal for you and your plans. 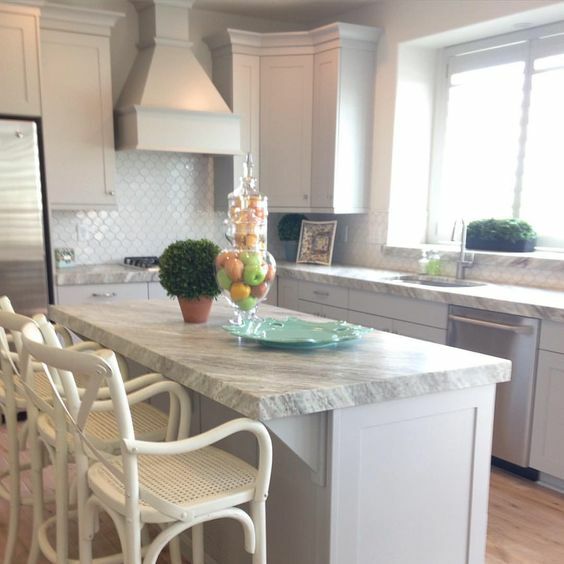 This quartzite definitely looks formal and with the white counters you get more of that. Here you’ve got a lot of light colors all at the same time, for a more crisp appearance. With some darker streaks and veining running though it, this piece of quartzite gives just the right accent. The otherwise white and basic kitchen definitely gets a unique feel. 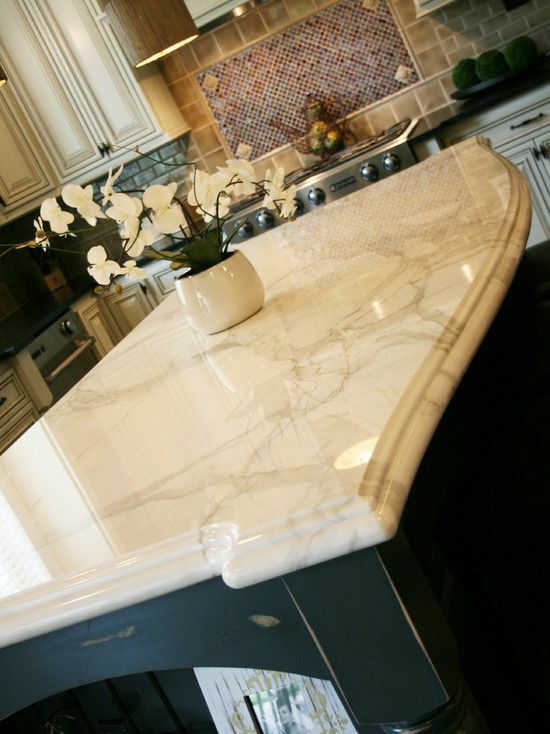 Here we have a little bit more ivory in the quartzite, which pairs beautifully with the dark island it’s covering. Paired next to ivory cupboards, it definitely ties things in. Plenty of light makes sure that these quartzite countertops shine. They also pair great with white cupboards and the complimenting backsplash. 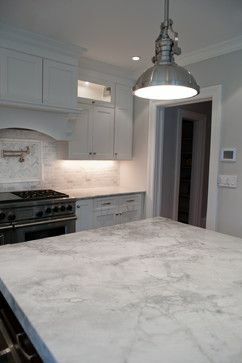 Rustic wood creates a unique compliment to the white and elegance of this quartzite. Get just the right balance between upscale and casual. 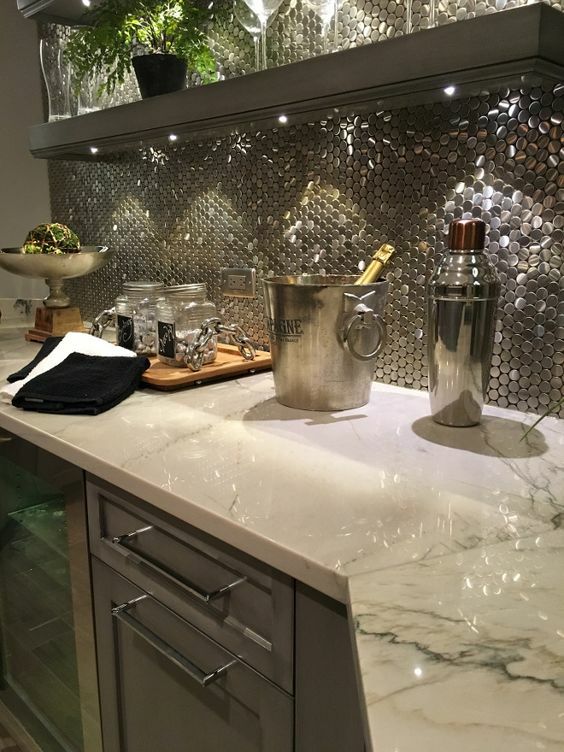 The gray cabinets help to pull the veining out of this quartzite and the shimmery backsplash helps. It’s a bright look that’s actually still toned down. 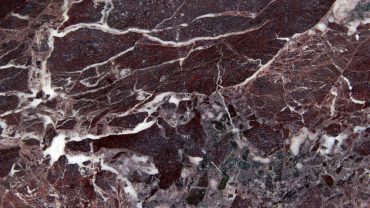 Bright red cupboards bring out the brighter colors and deep streaks in this stylish quartzite. You don’t get a lot of these shades in quartzite, but here you’ve got plenty. This piece of quartzite has some relatively stable veining all the way through. It also goes well with the darker countertops on the cupboards behind as an accent. 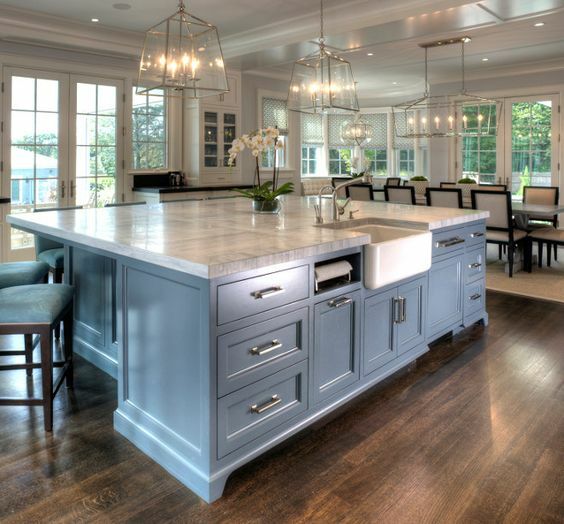 The gray on this island creates a perfect balance for the white and gray of the quartzite. 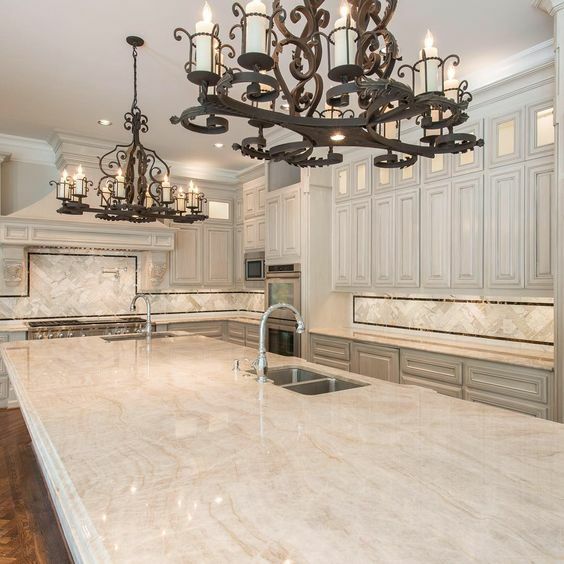 Plus, with this large of an accent piece in your kitchen, you definitely get elegance aplenty. The larger patches to these quartzite countertops make it stand out against the white of the rest of this kitchen. It even pairs very well with the old style brick in the backsplash. 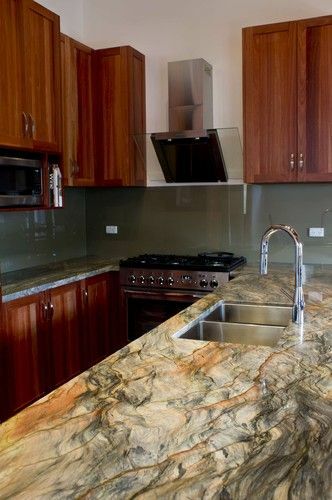 This island has a very stylish feel to it and the rough edges on the quartzine countertops definitely accent that well. You get something a little more rugged but no less styled. This whole kitchen screams elegance and with the beveled edges on the quartzine countertops you get that even more. Plus there’s quartzine accented through the backsplash which will definitely create a ritzy look. 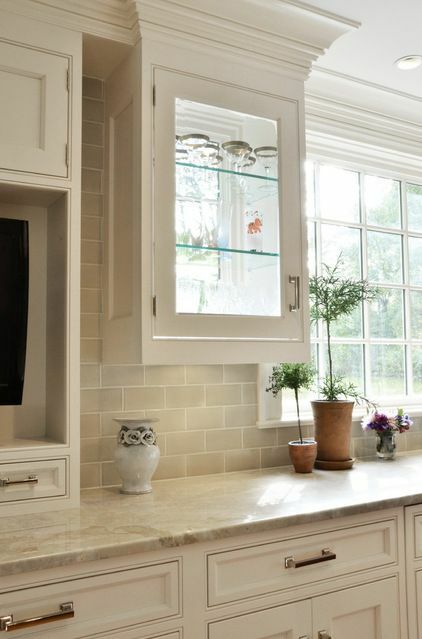 This quartzine extends all the way from the countertop up through the backsplash for a great accent. You’ll definitely love the flow, especially with the black countertops.